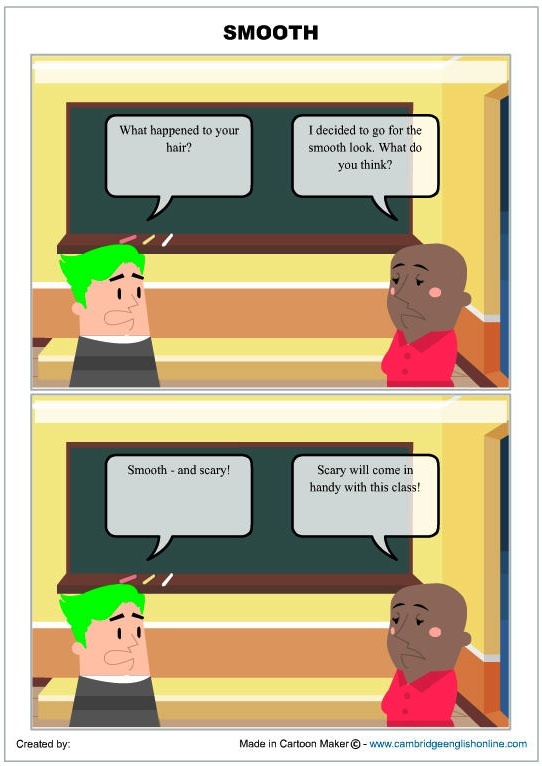 At Cambridge English Online, you can make strip cartoons in their Cartoon Maker Zone or Superhero Cartoon Maker. If you choose Cartoon Maker Zone, you can get started on your new cartoon by deciding on 1, 2 or 4 frames. Then it's time to add elements to each frame. Make sure to turn text bubble On. Under character, choose gender, then choose hair, face, clothes and head styles, some of which bring up a colour menu and may also have a tiny scroll button for more selections. You can also add narrative. To move to another panel, click it. Use tabs near Edit Scene to get your characters the way you want. I learnt to set the background first. Sometimes, when I changed the second panel, it changed the first panel dialogue too. I had to re-do. Remind kids to be sure to hit Apply to prevent frustration. The resulting cartoon can be saved as a jpg. You might need to rotate it with an image editor. I did. Cambridge English Online's Cartoon Maker is limited. But it's simple, and another online space where kids can play with story. Cambridge English also has a Superhero Cartoon Maker where kids can choose superhero, baddie and citizen characters for creating their stories in a similar way to Cartoon Maker Zone. Find more writing activities for kids by clicking the Writing button in The Book Chook blog's right sidebar. Wow, I wish this had been around when I was teaching EFL! @MarjorieI don't mind at all! In fact, I urge readers to follow your link to read about those great prizes. I've also popped it onto Facebook and Twitter. 10 years is fantastic Marjorie! Happy Birthday!